In the past couple years we've taken family trips I've felt that, if combined, would produce the perfect vacation. 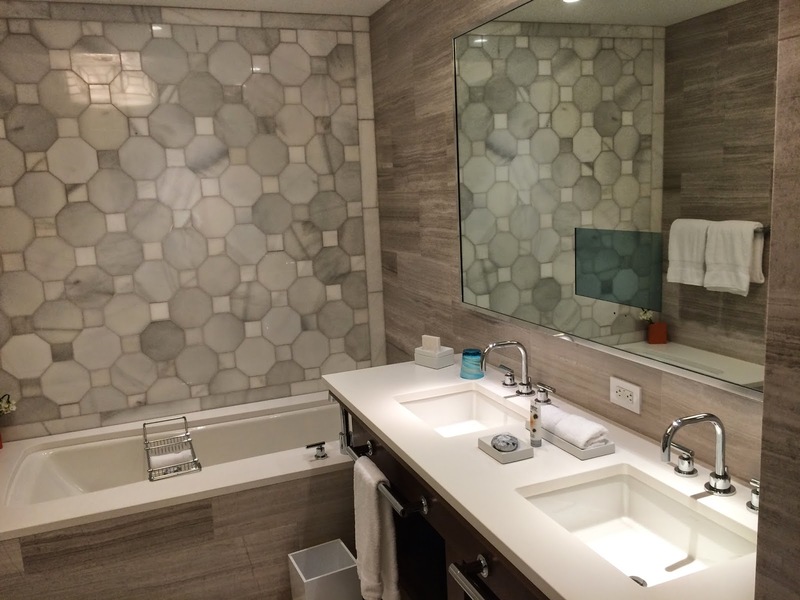 We stayed at the Four Seasons Residence Club Aviara (review) north of San Diego, visited Disneyland and (separately) Walt Disney World. One thing Disney does really well is theme parks. 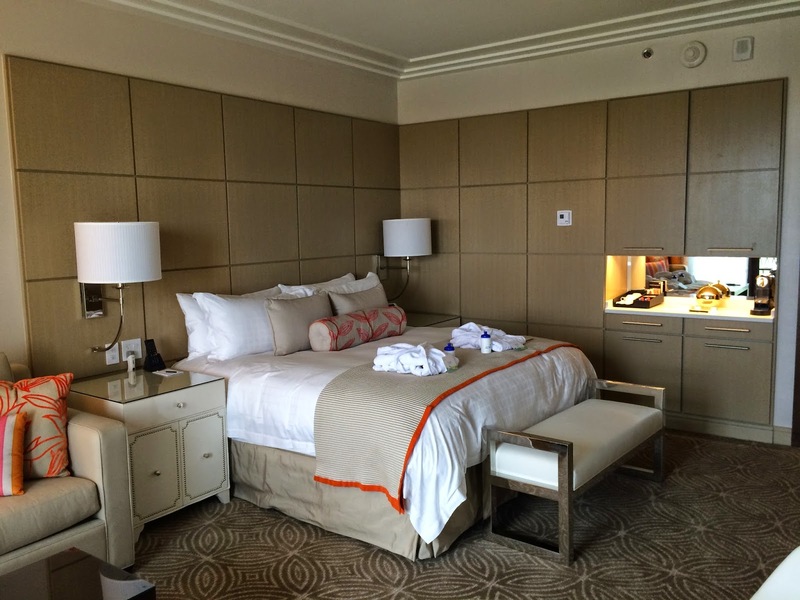 What Four Seasons does really well is hotels. With the arrival of Four Seasons Orlando at Walt Disney World the perfect combination was realized: Four Seasons lodging with Disney Parks. Four Seasons likes to operate at the top of the pricing range in any market which they operate. 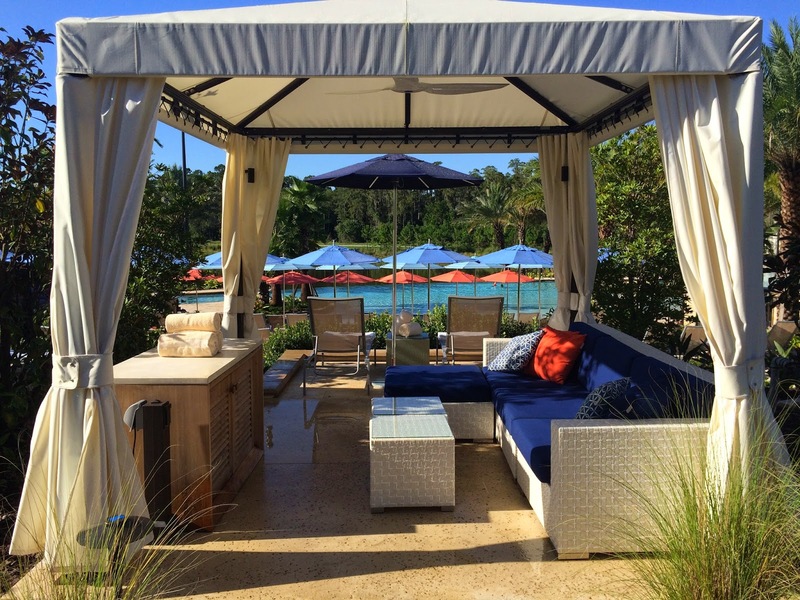 Disney sets the mark high with their Deluxe resorts. When I checked rates, Four Seasons Orlando was around the same price as Disney's BoardWalk Inn. Here's a useful rate comparison of Four Seasons Orlando to other Four Seasons and Disney Deluxe Resorts from Touring Plans. You see, for as much as I like Disney Parks I've got my concerns with them as a hotelier. Four Seasons on the other hand has blown me away with their style of service each time we've visited one of their properties. 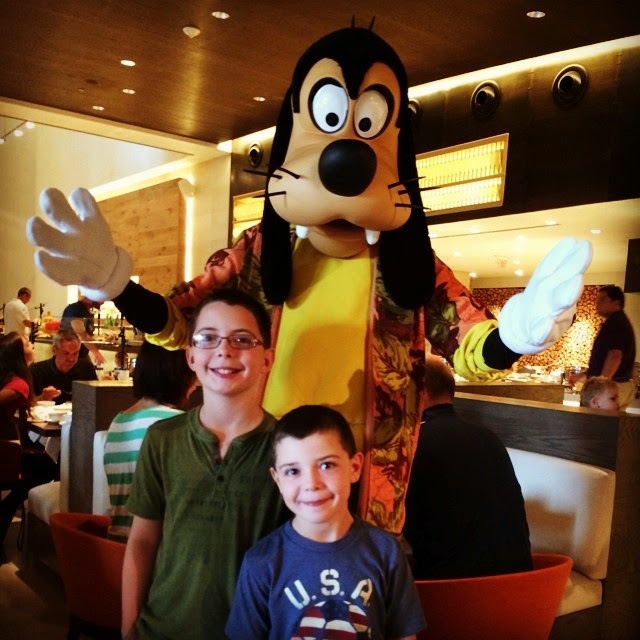 See: These Disney Cruises Infuriate Me - Why do I keep booking them? 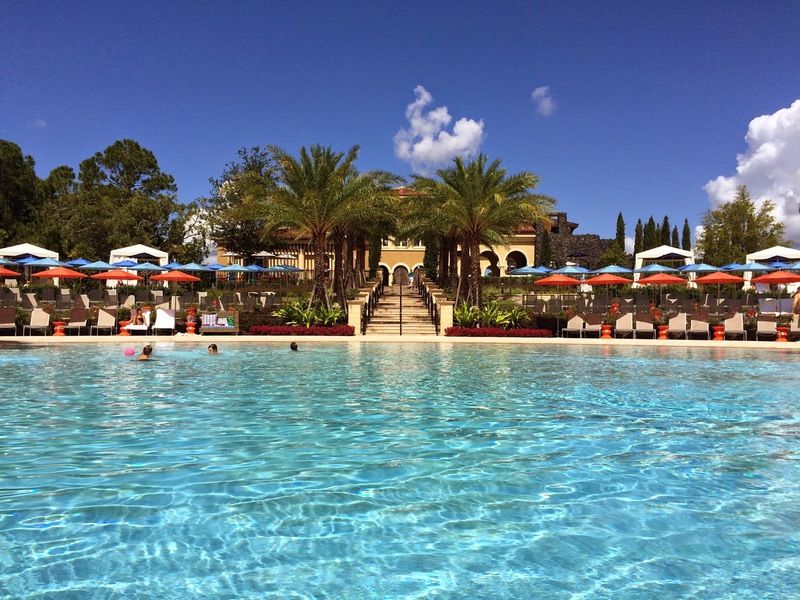 For the the dates we visited in early October Four Seasons Orlando was $545 per night. But they were offering a third night free promotion which would bring the price down to $363 a night if booked in 3 night increments. A four night stay works out $408 a night. Since the BoardWalk was booking for around $500 a night before discounts this was a rate I could justify in my mind. One thing people might not realize when booking high end hotels like Four Seasons, Mandarin Oriental, Peninsula, etc is that although discounts on these properties are hard to come by you can often stack the best available offer with additional promotions offered as benefits through certain credit cards and/or travel agents. For example the American Express Platinum Card offers a Fine Hotel & Resorts program where you can get benefits like free breakfast, early check-in/check-out, a $100 food & beverage credit and more on top of the best package a hotel might be offering. If you don't have an AmEx Platinum consider establishing a relationship with a Four Seasons Preferred Partner travel agent. It should cost you nothing additional to book your stay through them and some great benefits like complimentary daily breakfast and an additional food & beverage credit will convey on top of the best available rates. I booked through Brownell Travel. Drop me an email if you'd like a referral. One thing I love about the Four Seasons is how easy they make it to communicate with them. They never make you feel like you've contacted the wrong department. They just take care of your request no matter how you've routed it. For example I considered booking ground transportation from MCO to the resort through a discount offered on MouseSavers. But the deals were on the order of $10 so I just contacted the Four Seasons via email in their response to inquiry to see if they could do anything to make our stay more comfortable. They arranged a towncar for $155 round-trip which is on par with what it should cost. Without any additional intervention on my part and just a moment to compose an email ground transport was taken care of. Similarly I secured a reservation for a character breakfast at the resort. A quick email in response to their outreach is all it took and the reservation was secured. How many times have you talked to a business and they told you that you needed to route your request to a different department? That never happens at the Four Seasons. They just take care of it. In my experience, nobody orchestrates an arrival better. As an aside I will say that hiring a town car or taxi gets you on property faster than renting a car or taking Disney's Magical Express. Our flight got in at noon and we were at the hotel by 1 pm. And down at the pool moments later. Upon arrival we were greeted with the customary "Welcome to the Four Seasons" and the bellmen took our bags. We were escorted to the front desk to check in. While I was taking care of the details my wife and kids checked out the Disney planning desk and Disney World touch screen flat panel they have set up nearby. The desk agent escorted us to the elevators and we were headed up to the 10th floor. We reserved a standard room and received a modest upgrade to a Golden Oak View room. Although our room was technically "just" a regular hotel room with a combined sleeping area and adjacent bathroom, it was quite large (500sf) and extremely well appointed. Although the exterior of the hotel is set in a Spanish revival/Tuscan motif to match the Golden Oak residential community it is situated within, the interior is trendier and more contemporary. The appointments felt comfortable yet rich and sophisticated to me. The bathroom had double sinks, separate tub and shower and water closet. 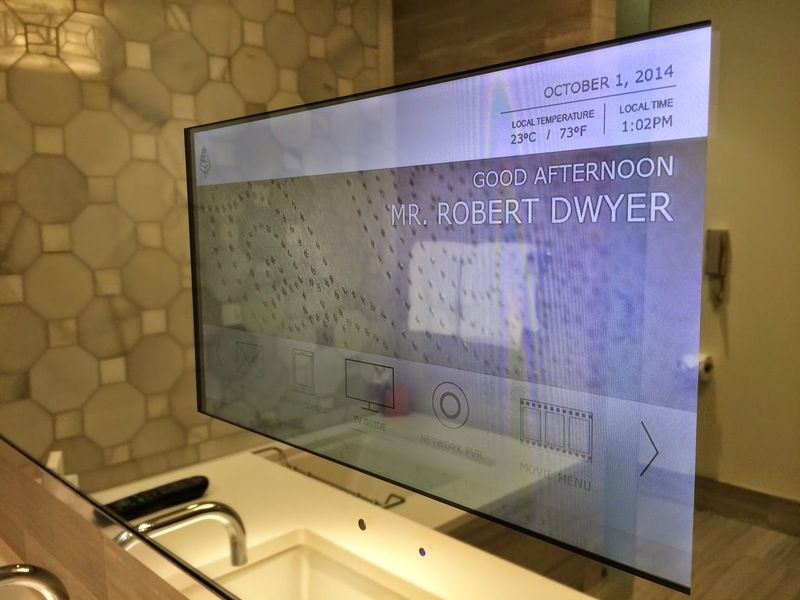 An in-mirror TV ensured our kids could watch cartoons while showing/taking a tub after a day in the pools. And I could watch SportsCenter while shaving. Well good afternoon to you in-mirror TV! The bed is insanely comfortable and the overall in-room experience is carefully designed to provide the best night of sleep of your life. After days visiting the parks or relaxing by the pools I slept the sleep of angels and wondered what we could do to make our bed at home more like the one there (we've already got the pillows). Rounding things out were toiletries from C.O. Bigelow Apothecaries, a Bose Soundlink bluetooth speaker (that you could use to stream high quality music from your smartphone), and robes for every member of the family - even little ones for the kids. Just when we got done gawking at the room our luggage arrived. They've got the timing down perfectly. We debated heading over to the parks for the afternoon but we were drawn to the pools to check out what the resort had to offer. The pool area includes a tranquil adults only pool, a kid-friendly family pool, an impressive splash pad for younger kids, an incredibly fun lazy river, and dueling 242-foot waterslides. What pleased me most about the expansive pool are was how there was something for everyone. 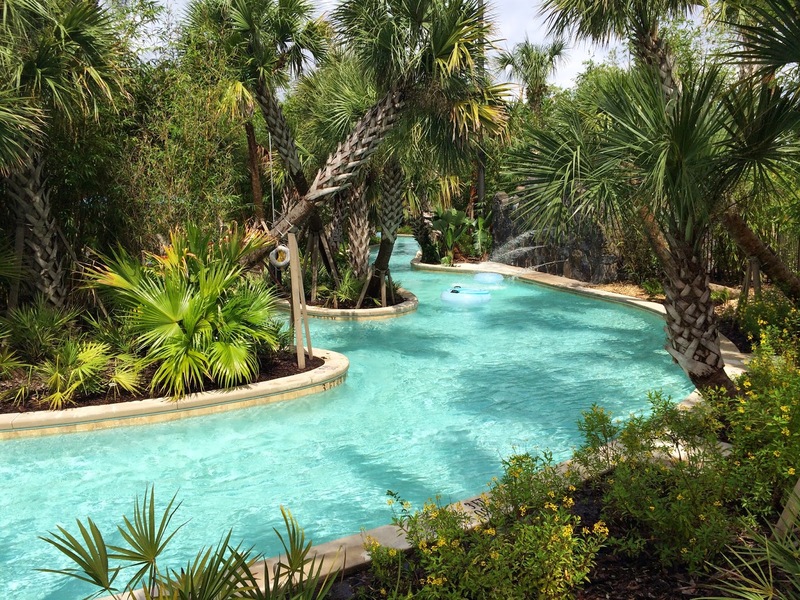 If you wanted to set yourself up in a shady secluded area near the lazy river you could. If you wanted a sunny spot near the pool area that was available too. What I was thinking as we were enjoying ourselves was how I could see every member of every family I know finding something fun to do somewhere at the resort. 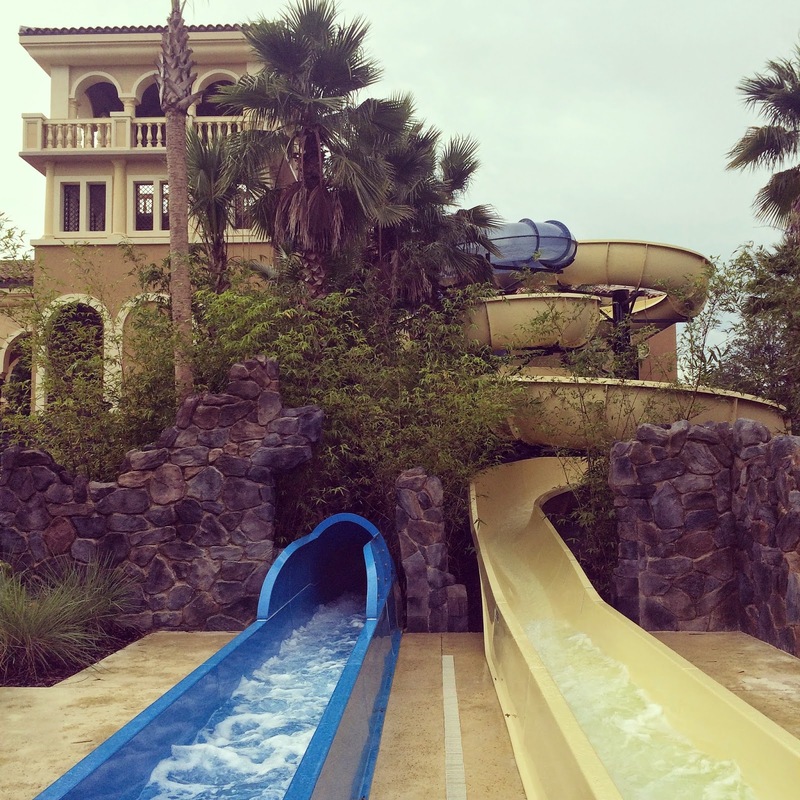 Dueling 242-foot water slides are perfect for racing. Again and again and again. During our stay we experienced pouring rain, blazing heat, and surprisingly chilly morning temperatures. We enjoyed the pools under almost all of these conditions but I think its value would be at its peak during the warmest months when the parks are unbearably hot. The biggest area where Four Seasons differentiates itself is how it offers personalized intuitive service that anticipates guest needs effortlessly. It's really quite amazing. 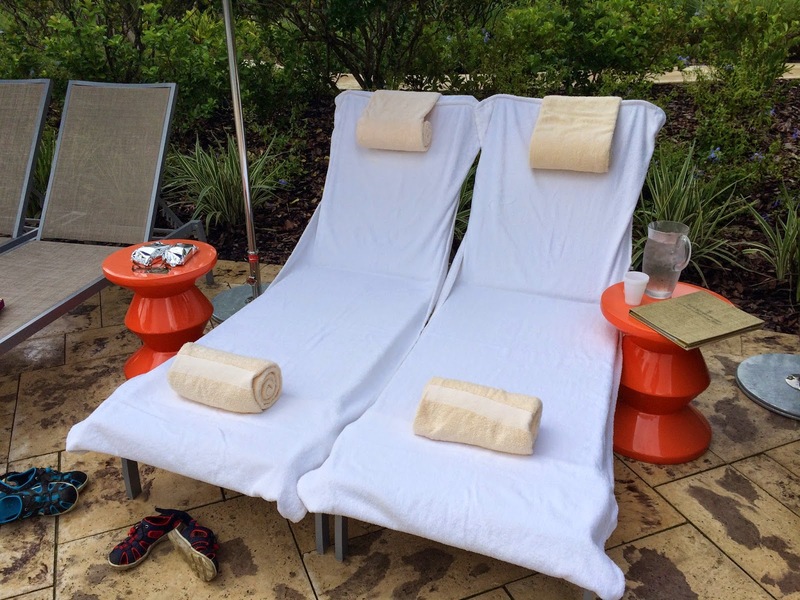 For example, in the pool area when a guest enters the area they are consistently greeted by an attendant and "set up" with towels over chaise lounges and additional towels for drying off. 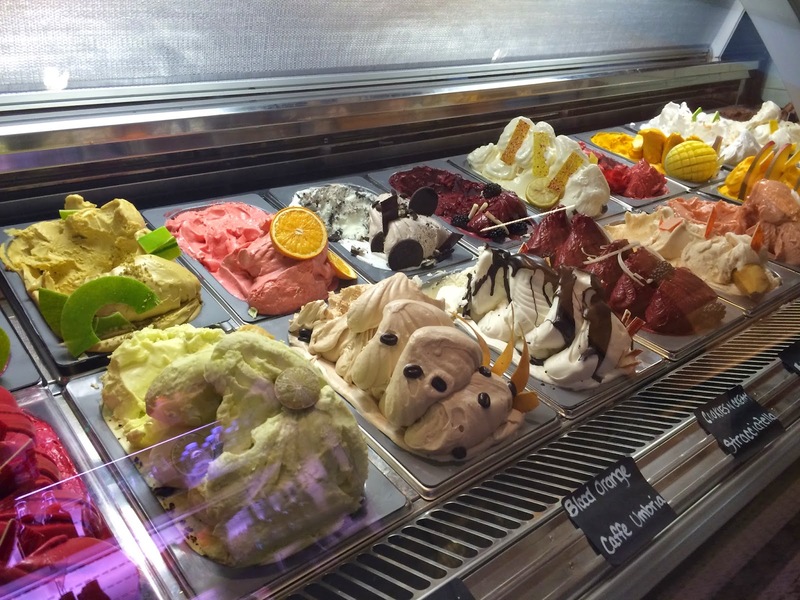 Fresh ice water is provided and a food & drink menu is provided. No pressure, but they check in every 15 minutes or so to see if there's anything they can offer. Contrast this with other resorts where you're lucky to get a couple towels and occasion drink service. The difference is amazing. Probably the most striking difference between the Four Seasons and Disney properties is the utter lack of crowds. The hotel wasn't at capacity when we visited (all of the rooms aren't even built out yet) but I get the sense that even if it were at 100% capacity it still wouldn't feel crowded. There were so many chairs in the pool area. And not just rows and rows of chairs - all kinds of little pockets where you could set up depending on your mood and interest in getting sun, shade or a nap. Another example of the Four Seasons service standard: When we were checking out there were a few other couples also talking with desk clerks. After 15 seconds or so yet another desk clerk appeared an apologized for keeping me waiting. For 15 seconds? No worries. But if you compare this to some high end Disney resorts where long waits aren't unusual - the Four Seasons difference is striking. 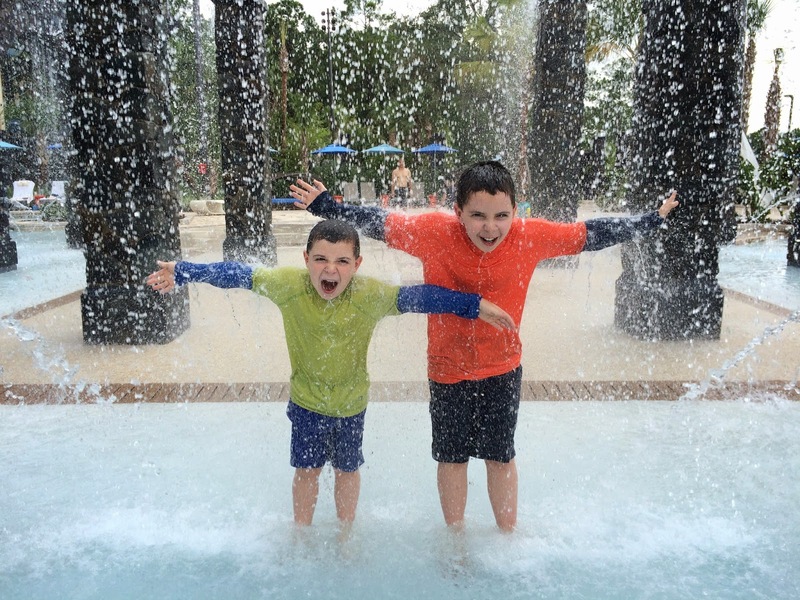 The resort offers their Kids for All Seasons program on a drop-in basis from 9-5 each day. The counselor to child ratio is incredible. 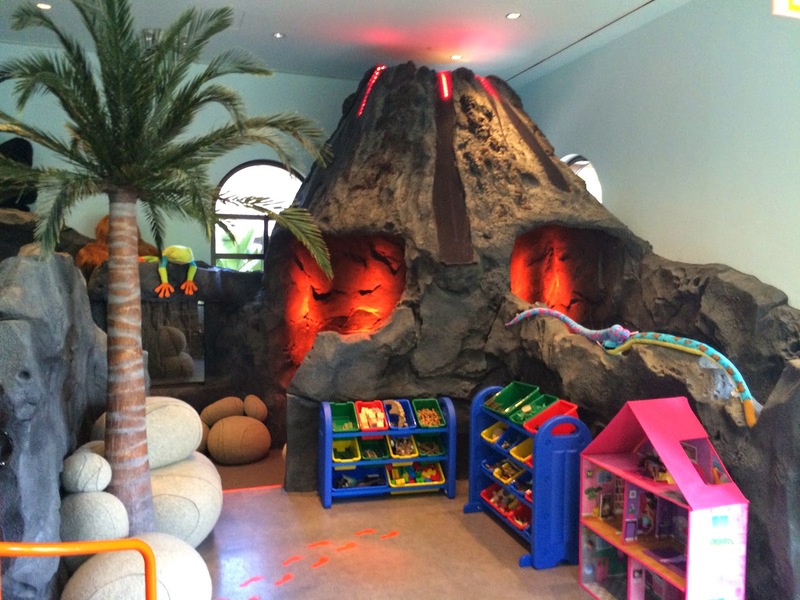 If there are just a few kids there they tailor the activities to the kids liking. When there are more kids they operate on schedule with group activities like water balloons, swimming, and outdoor activities. What I liked best about the Kids for All Seasons program is the amazingly easy drop-in nature of it. Our first day there the kids were checking out the property and didn't have time to think about checking in. The second day there we spent the whole day by the pool. By around 2 pm it was very hot out and we were all ready for a break. We dropped them at the kids club and headed over to the adults only pool. 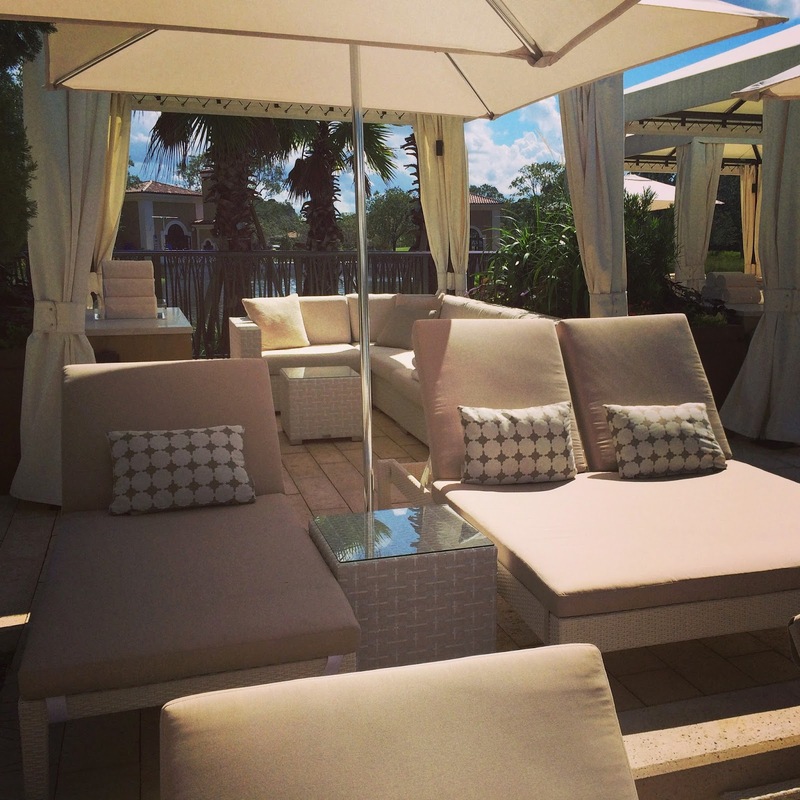 The chaise lounges were even more comfortable there and I felt asleep poolside for, I think, the first time ever. It was truly paradise. Every single person we interacted with at the resort was amazingly kind and friendly in a non-stuffy kind of way. 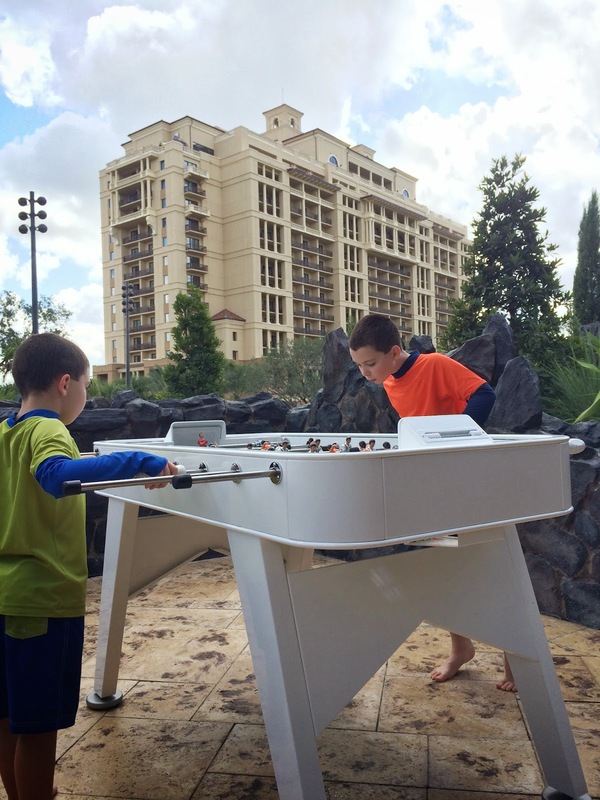 More notably than anything the Four Seasons Orlando, within the Golden Oak community within Walt Disney World, is an enclave within an enclave that provides peaceful retreat after a hectic day at the parks. Our room rate included daily breakfast for two adults. We chose to take this as room service and added reasonable $6 choices for the kids which resulted in a very nice start to the day. 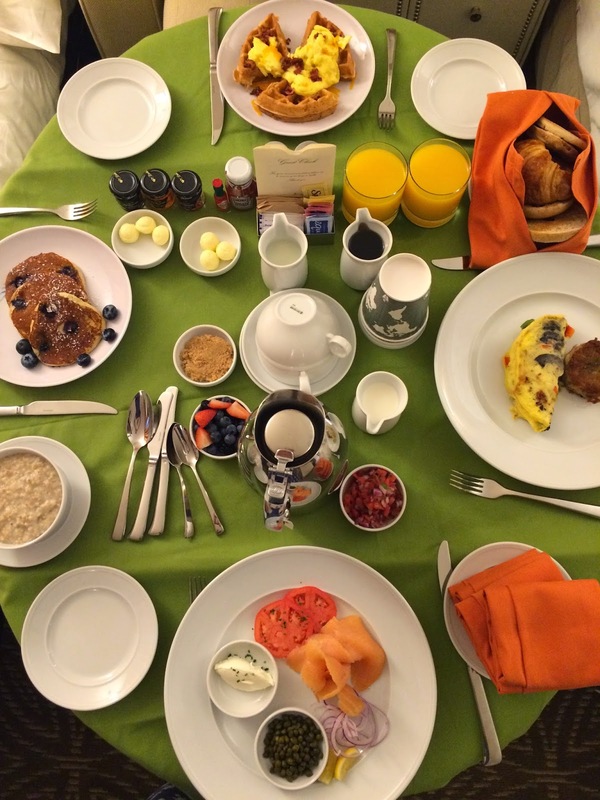 Passing around the in-room iPad mini to make selections the night before was fun and each morning breakfast was deliver precisely at the requested time. 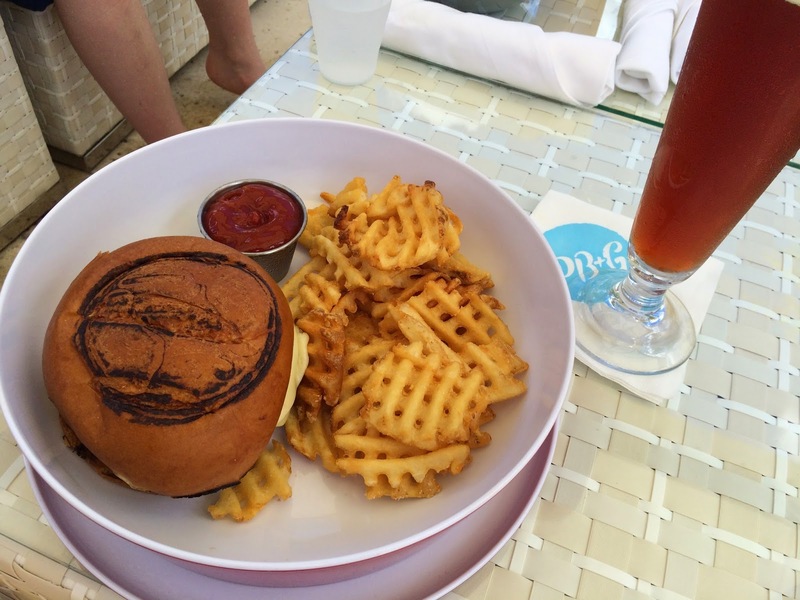 The poolside dining options were served up by their "PB+G" restaurant (pool bar & grill). During our stay I tried the fish tacos, the burger, and an off the menu pulled pork sandwich. For me, the burger was best. At $20 it was pricey as you might expect but very much worth it. Twice a week they offer a Disney character breakfast featuring Mickey & Pals. We did a character breakfast at the Grand Floridian a few years back and it was a hectic gut-busting affair. 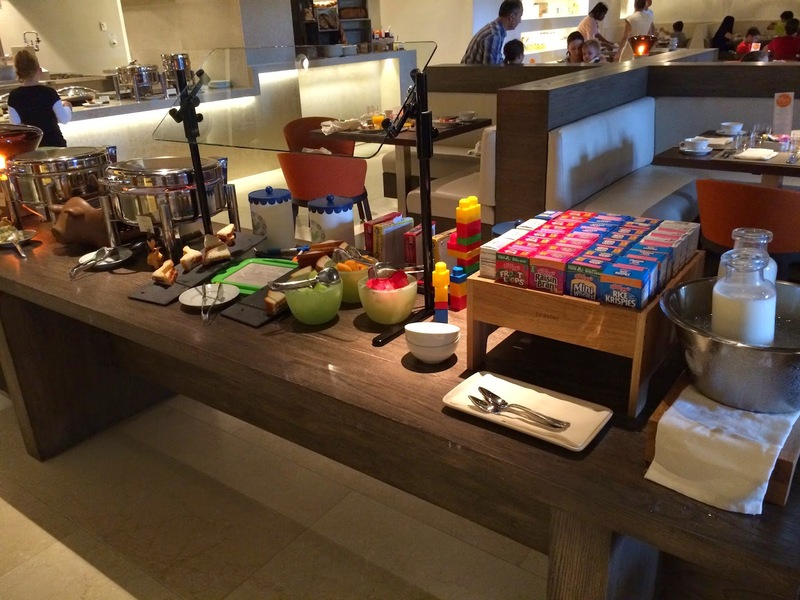 In contrast the character breakfast at the Four Seasons featured fresh berries, local cheeses, honey, and fruits. Appealing charcuterie and eggs/omelettes made to order made it one of the more enjoyable meals we experienced. The buffet was beautifully laid out. They even had a section set up for kids at their height so they could see and select items for themselves. Brilliant! Highly recommended, but I think I made a tactical mistake with the character breakfast given the package we booked. That morning we didn't take advantage of our daily breakfast and although the resort made it clear the character breakfast wasn't included in the free breakfast offer I thought they might knock $32 off our bill (or some accommodation for the complimentary breakfast we didn't enjoy in-room that morning). When I asked about this at check-out I was told that the character breakfast was excluded from the free breakfast offer so I let it go. This was my only minor point of disappointment in our stay. Character breakfast with Goofy & Pals was a hit! The resort is incredibly family-friendly. When we checked in they gave the kids "passports" that they needed to get stamped at each area of the resort. Once they filled their books up they could redeem them for tokens for free gelato at Lickety-Split. A Cuban restaurant (at the adjacent Tranquilo golf course) and a Brazilian Steakhouse are coming soon. We'll have to go back to check them out! 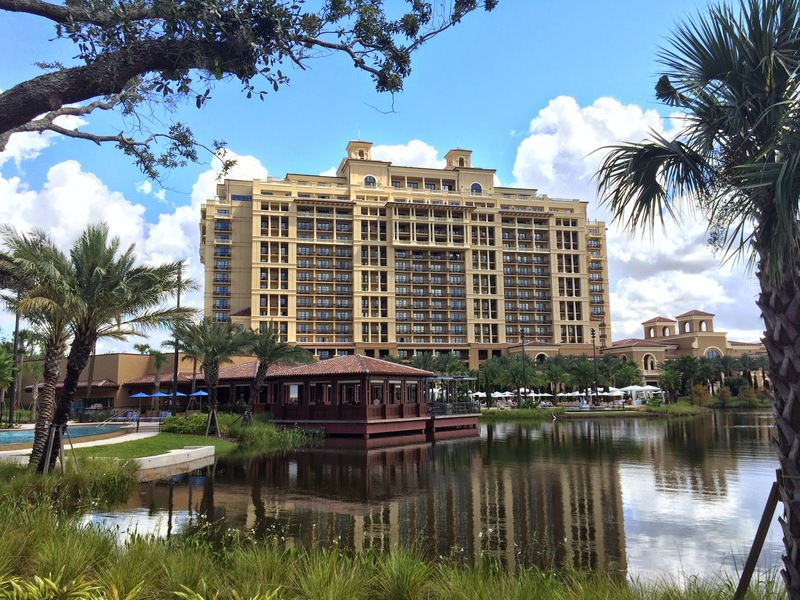 At a cost that's in line with Disney Deluxe Resorts and accommodations, and amenties and service that are far beyond, I consider Four Seasons Orlando at Walt Disney World to be a value. All things considered it is a nearly perfect family-friendly luxury resort. But I was thinking what could possibly make it better? A private beach on the ocean I guess. You look at some of the best beachfront resorts in the world and that obviously isn't possible in Orlando. And while Orlando is great it doesn't have the exotic feel of say Hawaii or the Maldives. And it doesn't have the residential feel some rental options offer. But for what it is I think it's nearly perfect. 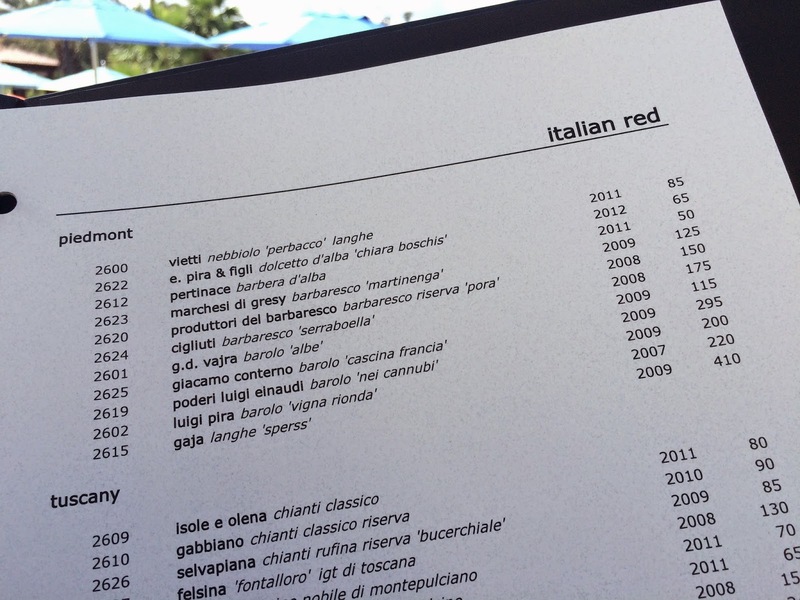 I'll hope to go deeper into comparisons between this resort and other splurge-worthy options and discuss which Disney Resort benefits do and don't convey when staying at the Four Seasons in future blog posts. I'd love it if you subscribed for updates. Thanks for doing this awesome review of four seasons. I would love to take my kids there when i visit orlando next month but $1000 per night gives me shivers. Hello! We are traveling to the four seasons in May and my sister wants to come visit the kids at the pool one day. Do we get wristbands or something? How tough are they if she wanted to come see us at the pool? A little hesitant with the 'double beds' option or pull out sofa for the kids option - my kids are a little older at 12 & 15 and not fans of pull outs. not sure why they couldnt put in queens.